WordPress Notification bars help you to direct user attention to a particular offer or call-to-action. With the right design and proper copy, a notification bar can vastly improve your lead generation and boost user engagement on your website. If you are a WordPress user, then you will not be able to integrate notification bars to your site by default. But there is nothing that a good plugin can’t fix. In fact, the WP marketplace has hundreds of awesome WordPress notification bar plugins. However, not all of this plugins are equipped with the right feature set to suit your needs. A little research is needed to understand what features you need, and what is the best value for money plugin which delivers all those features. Now lucky for you, we have taken care of the research part and put together a list of the best notification plugins for WordPress. Here you will find a diverse range of plugins catering to different users with different needs. Also, we have included both paid and free plugins. This way, despite your budget you will be able to find something that fits your necessities. Other than this, you get to choose whether or not you want the bar to be placed at the top or bottom. You can also have it stationary at a fixed position like a sticky bar. Another option allows you to set some seconds after which the bar will pop up on your visitor’s screen. 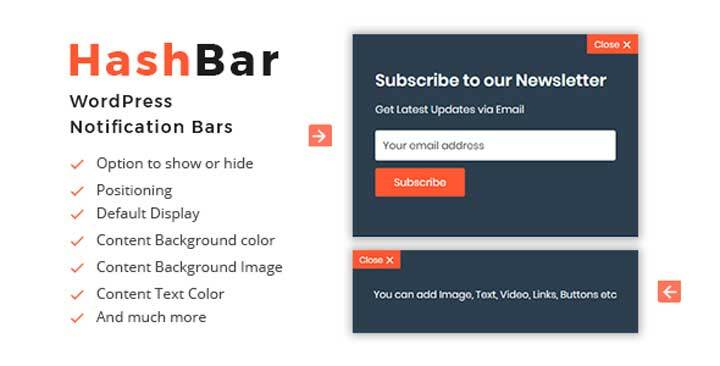 Top Bar is one of the easiest to use WordPress notification bar plugin in the market. It is designed to cater to beginners looking to try a free solution for setting up their website notification bar. It can help you integrate a clean and straightforward notification bar at the top of your site to display a message to your visitors. Now it is worth noting that this is a freemium plugin. The basic plugin is available for free, but you can also make an upgrade to the pro version if you want access to advanced features. With the free version, you will be able to create unlimited notification bars with different text messages in different color settings. But with the pro version, you get added features for customizing the look and feel of the bar. You can also set a period before the bar pops-up on the users’ screen. You can also configure it such that it only appears to guests or registered users. WordPress Notification Bar is another freemium WordPress plugin to help you set up a notification bar and a call to action for your website. It is super easy to use and very quick to set up. The free version is amongst the most popular notification bar plugins for WordPress, and packs in all the basic features you may need from your notification bar. First and foremost, the free version alone allows you to set up custom messages and a call to action button. You can also configure your notification bar to be a sticky bar so that it is always present on your readers’ screen. There is also color customization options along with i18n support. Now, coming to the pro version you get the added functionality of having unlimited bars on your website. You will also be able to capture email leads, integrate social icons, gain access to more colors for more in-depth customization, and also set a custom countdown timer for the bar to pop-up. Hello Bar WordPress plugin is probably the most well-known WordPress notification bar plugin in the market. It is jam-packed with excellent features that will not only help you to showcase a message but also help expand your business and gain more leads. It is super easy to use. In minutes, you will be able to create and set up custom pop-ups to go off on your site. The plugin showcases call to action functionalities so that you start generating some leads. It is compatible with thousands of apps and offers seamless email integration. Some of its notable features include access to a team of expert copywriters who will review your site and recommend high converting headlines for your site. Also, you can take advantage of the exit intent technology to perfectly time a call to action pop-up notification. Other than this you get support for A/B testing, over 200+ targeting parameters, and Google SEO compliance for improved search rankings. 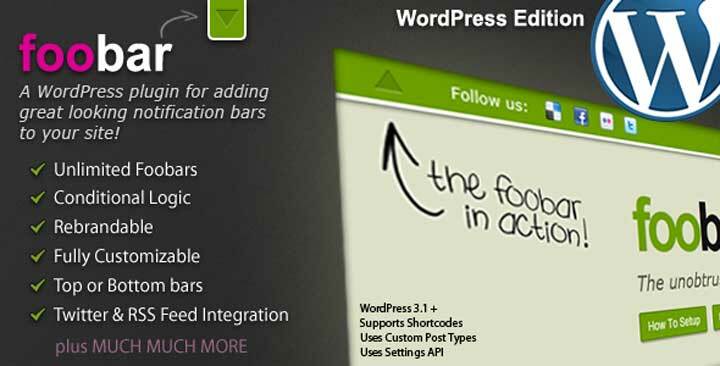 Foobar is one of the best selling premium notification bar plugins for WordPress. There is no free variant, and you will have to invest if you wish to access its repository of advanced features. The key selling point for the plugin lies in how intuitively it allows users to build an excellent looking notification bar. Now coming to its list of advanced features, one of the most distinct functionalities you will get is Conditional Logic. This allows you to configure different notification bar triggers based on user action. Other than this, you will get full customization options, the ability to set up unlimited Foobars, along with the flexibility to have the top as well as bottom bars. The plugin also supports shortcodes which makes it super simple for placing your notification bars. Social media integration and lead generation opportunities have also been included. RSS feed integration is also thrown into the mix. With Notification Bar for WordPress plugin, the name says it all. It is a plugin that helps you display a notification bar on your WordPress website. With the notification bar installed, you will be able to showcase new releases, offers, and custom messages to your readers. You will get this plugin in a free version as well as paid version. The free version itself is very rich in features and will allow you to set up high-quality notification bars on your website. For starters, you will get to choose between 4 different placement options for your site. You can also set how the bar will appear on the screen. Then there are plenty of color options for customization. The paid version builds on top of all these features by adding some awesome predesigned notification bar templates, social media integration, and a lot of flexibility as to how and where you want the notification bars on your website. 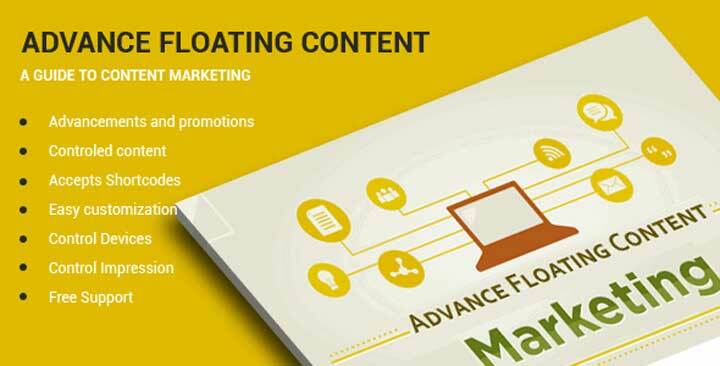 Advanced Floating Content is like a one key fits all content marketing plugin for WordPress. However, what interests us here is that the plugin heavily utilizes notification bars and similar functionalities, which is precisely what we came looking for. With this notification bar plugin, you will get a plethora of features which might have required you to download and install multiple plugins. 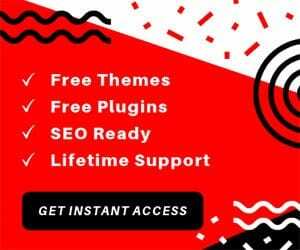 But now, with this all-in-one bundle, you get features like sticky footer notice, sticky header warnings, float notifications, and social media integration. You will also get access to some detailed statistics on how your notifications are performing. Other important features worth mentioning would be its vast customization options, option for video embedding, a theme builder for designing your notification floaters, and also the option to disable notification depending on the width or height of the screen. Notification Bar Pro is one of the 20+ onsite marketing tools offered by Zotabox. All these tools are WordPress plugins. With the Notification Bar Pro plugin, you have the option to create a fully customizable and responsive promotion header bar. You can use it to promote news, announce special offers, provide gifts and discount codes, and much more. Needless to say that if you use this plugin along with Zotabox’s other marketing tools, then you will get a far richer experience. But if even you don’t, here are some notable functionalities that you get with the free plugin. First of all, you have integration with mostly all the popular mailing services like MailChimp, Aweber, and so on. Second, the plugin is coded to load up asynchronously which means it won’t affect your site’s loading speed. On top of that, all aspects of the notification bar are fully customizable. And did we forget to mention that you will get Social Media integration as well? 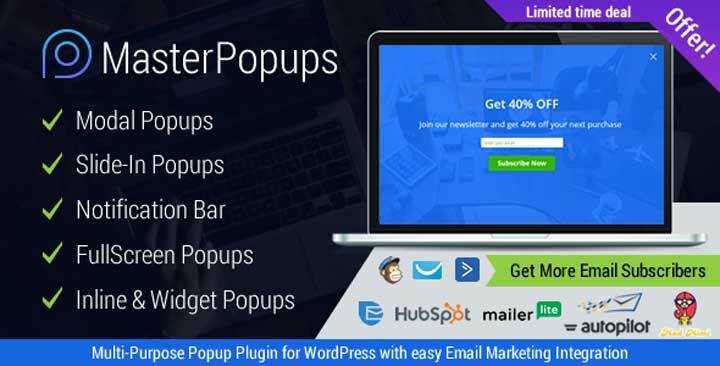 Master Popups is a premium popup plugin for boosting your email subscribers. However one of its features does allow you to set up a dedicated notification bar on your WordPress website. Other than notification bars, it supports Modal Popups, Full-Screen Popups, Slide-In popups, and also Inline and Widget popups. However, we are interested in its ability to create notification bars on your website. Related features include a powerful visual editor with which you can create your notification bar in minutes. You will also get access to many elements to make your notification as attractive as possible. As far as the placement of the bars goes, you are given two options – top and bottom. Other features include the option to fix the notification bar using sticky mode. Extensive customization options along with multiple predesigned templates. And since the plugin focuses on increasing your email subscriber base, you get compatibility with mostly all the leading email marketing services. 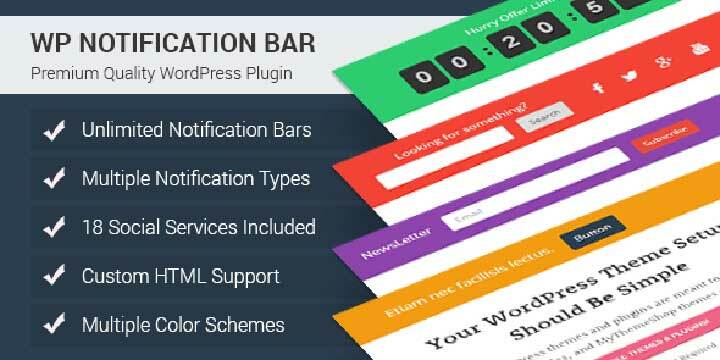 WP Notification Bar Pro is a premium WordPress notice plugin that will help you set up custom notification bars and alerts on your WordPress website. The main focus of the plugin is to help you increase your email list, better manage marketing promotions, improve your social media followers, and overall grow your audience. With the plugin, you have the option to create an unlimited number of notification bars and assign them to different notification types. You can also populate the bars with various elements such as text and link buttons, post content, newsletter, social media icons, a countdown timer, and even a search form. And there is also the option to use your custom HTML codes to add custom functionalities to the notification bar. Besides this, other features include the option to set priorities to the notification bars, choose who it will slide-in to your visitors’ screens, track the number of views each notification bar, do A/B testing, and much more. There is also full compatibility with most of all the popular email marketing services. If you are looking for a WordPress plugin that will let you create fancy notification bars in all shapes and sizes, then Apex Notification Bar is worth consideration. 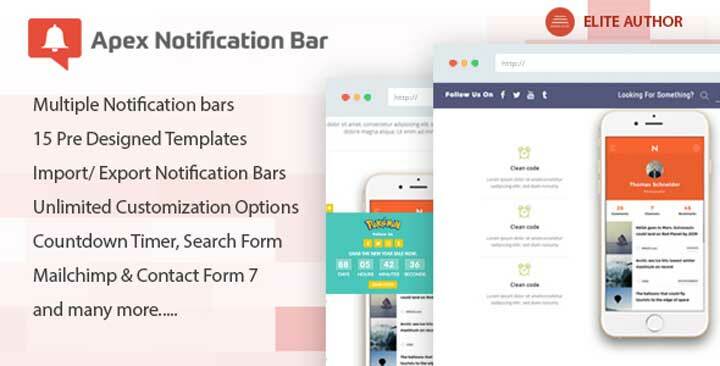 The plugin offers you 15 pre-designed notification bar templates topped with unlimited customization options right out of the box. This plugin will allow you to display a custom logo and custom background on the notification bar for branding purposes. On top of that, you can add your static text to connect with your readers. And that’s not all. 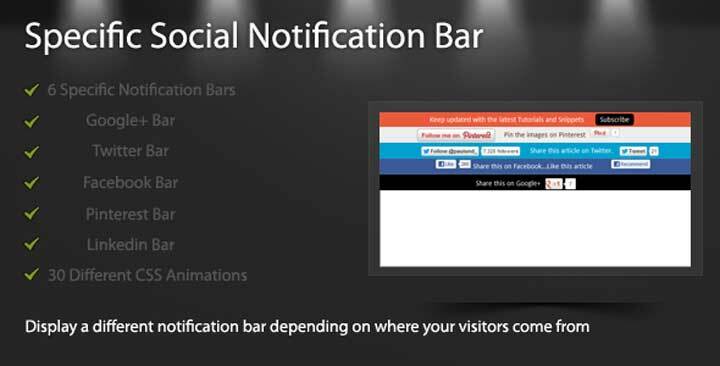 There plenty of other notification bar components which will enrich your website. For starters, you get the option to set up an Opt-In Subscribe Form to gain more leads. Also, if you’re launching a new product or a new service, then you can set up a countdown timer. Search forms are also available if you want to facilitate better site navigation. And lastly, you have the option to feature Twitter feeds, and RSS feeds through your notification bar. Showing a generic notification bar to your visitors will not always be effective at optimizing your conversion rates. Specific Social Notification Bar plugin for WordPress allows you to set up different notification bars depending on which social network your audience came from. The plugin supports Twitter, Facebook, Pinterest, LinkedIn and Google Plus. You will have the option to set up a custom message to showcase on the notification based on which social network the visitor came from. This way, you can target your audience based on which social platform they link and write a perfectly catered message for maximizing social shares. Besides this, there are also some customization options with the plugins to help you tweak around with the design. You get a total of 6 Specific Notification bars to choose from. On top of that, there are 30 different CSS animations to help attract and engage your users. Quick Bar is a free WordPress plugin that allows you to create popup notification sidebars on your WordPress website. You will get some predefined positions on each side of your site where you can place them as floating sidebars. To add the content for the notification, you will have to use the standard WordPress content editor. The plugin does give you some useful options to play with and decide how you wish to show the notification sidebar popup. For example, you get access to some display settings which will let you tinker with how the notification will look. Then there are a bunch of logic settings where you can configure when you want the plugin to pop-up. Now, from the features, you can understand that it is a pretty basic notification bar solution. 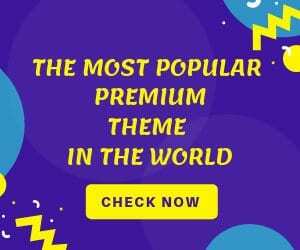 If you intend to promote special offers, provide a subscription form, integrate social media icons, and take feedbacks, then this plugin will suffice. But if you want anything extra, then you are better off with some of the other plugins on this list. HashBar Pro is one of the affordably priced premium WordPress plugins for creating notifications for alerting your users or showcasing specific offers. As far as utility is concerned, the offering is pretty basic. You can use the plugin to display offer text or include subscribe buttons to increase your email list, but that’s it. But the area where the plugin shines would be with the amount of flexibility it grants users for positioning the notification bar. You can display the bar on any one of the four sides of your website. There is also the option to show or hide specific notifications based on the page or post. You also get some customization option with the background color, background image, text color, background opacity and so on. On top of that, the notification bar will have full compatibility with Visual Composer – one of the most popular and influential page builder plugins for WordPress. Any Other WordPress Notification Bar Plugin? So these were our picks for the top 14 notification plugins for WordPress. We hope you found this list to be helpful. Also, if you have used, or you are currently using, one of the plugins mentioned here, then write about your experience using them. Your fellow readers will like to get some insight from you which might help them with their own decisions.